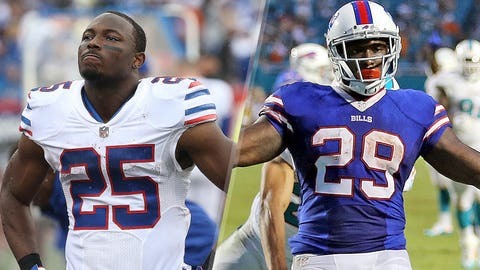 LeSean McCoy and Karlos Williams missed practice Thursday and are unlikely to play Sunday. Buffalo Bills running backs LeSean McCoy and Karlos Williams don't appear as though they'll be on the field Sunday against the Tennessee Titans. Both McCoy and Williams missed practice on Thursday due to injury. McCoy is dealing with a lingering hamstring issue dating back to mid-August and has said he won't return until he's 100 percent. Williams, however, sustained a concussion in Sunday's loss and is uncertain to play this week. Rex Ryan said it's a “reach” for him to be on the field against the Titans as he's still in concussion protocol. If Williams and McCoy are unable to go, Boobie Dixon is prepared to start. He hasn't started a game since 2013 with the San Francisco 49ers, and it was the only one of his career.